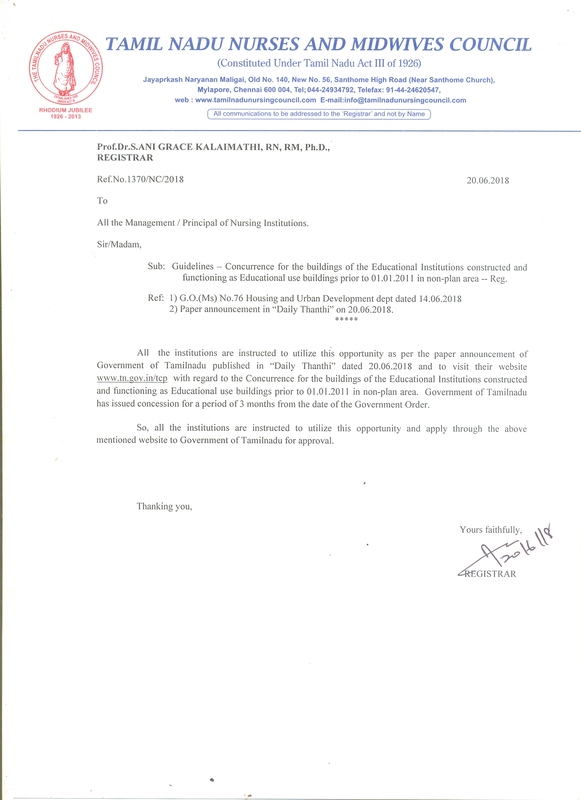 CIRCULAR TO ALL THE SCHOOLS OF NURSING (ANM/DGNM/PBDiploma) -- CERTIFICATE VERIFICATION FOR 2018-2019 -- INTIMATION -- REG. 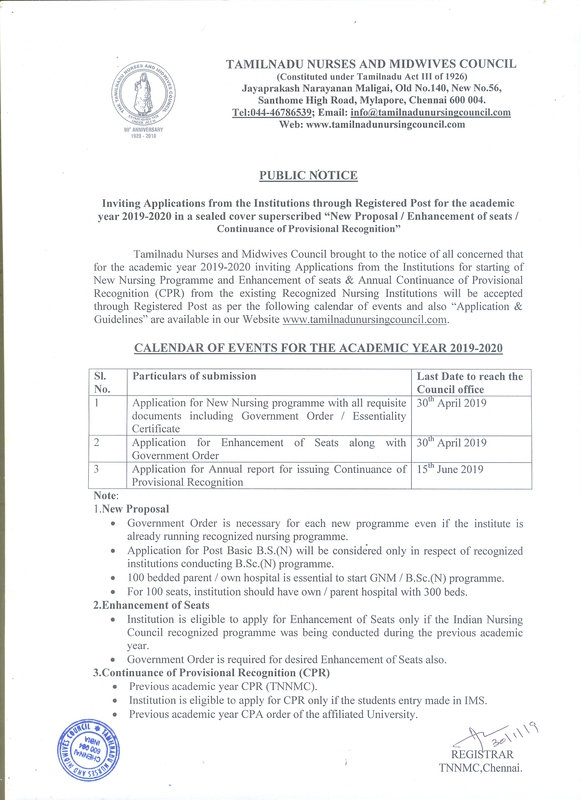 PUBLIC NOTICE - INVITING APPLICATIONS FROM THE INSTITUTIONS FOR STARTING OF NEW PROPOSAL / ENHANCEMENT OF SEATS / CONTINUANCE OF PROVISIONAL RECOGNITION - REG. 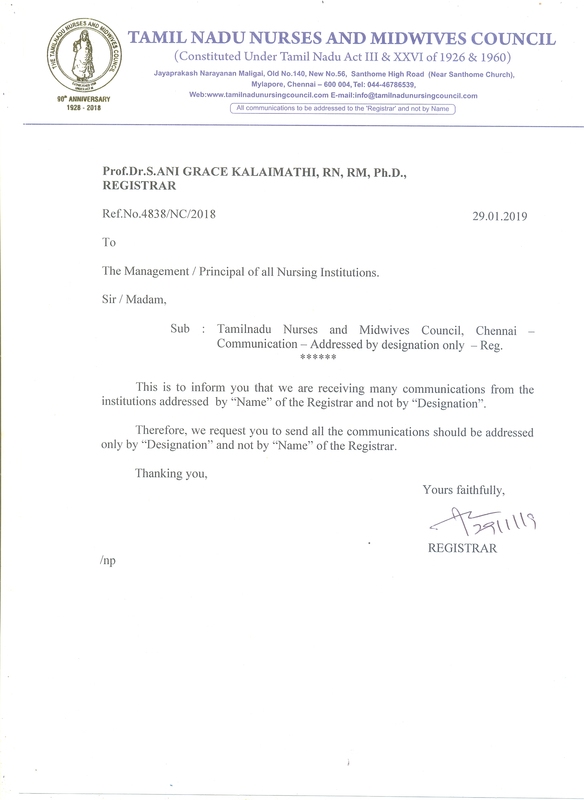 CIRCULAR TO THE MANAGEMENT / PRINCIPAL OF ALL NURSING INSTITUTIONS -- ANY COMMUNICATION TO BE ADDRESSED ONLY BY "DESIGNATION" -- REG. 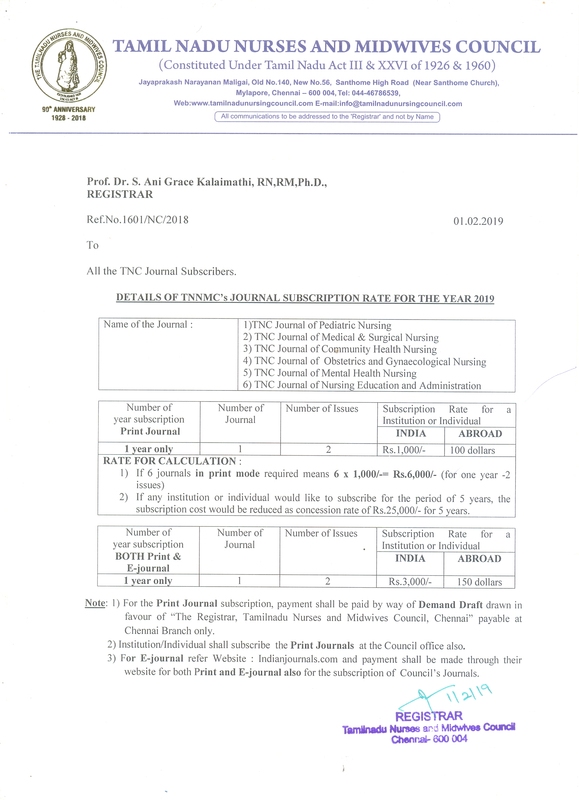 Announcement of TNNMC's "Best Nurse Awards - 2019" -- Guidelines and Application Form -- Reg. National Florence Nightingale Awards 2019 - New Delhi - Reg. 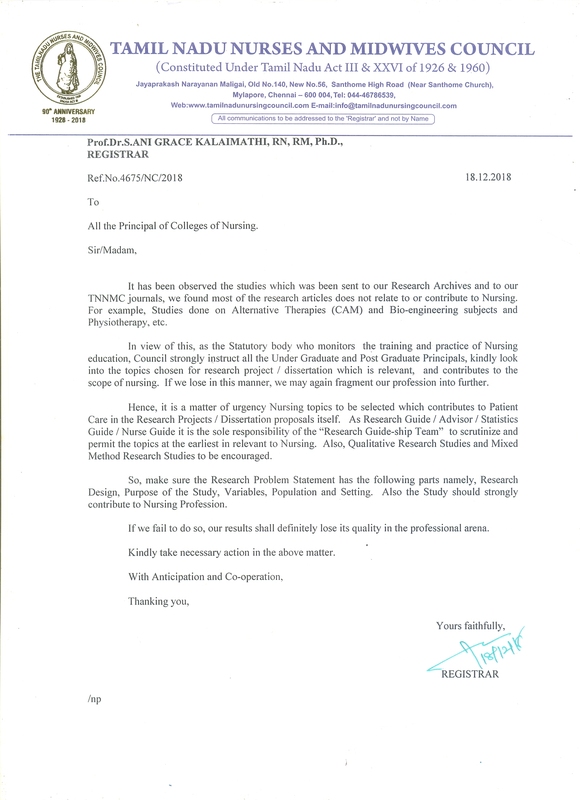 Kind Attention to all Principals of Colleges of Nursing -- Research Articles -- Reg. 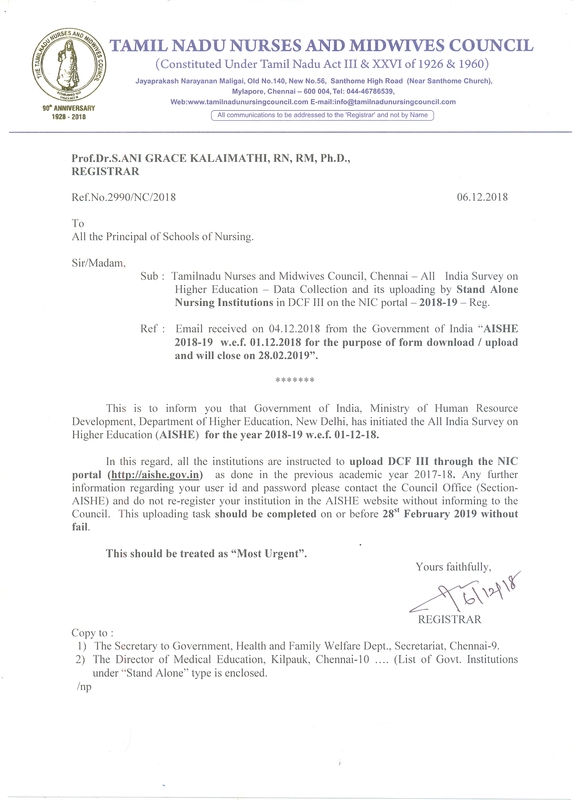 NOTIFICATION - Extension of Last Date of Admission for all Nursing Programmes from 30th November 2018 to 31st December 2018 - Reg. Kind Attention to all Principals - IMS link will be active from 1st November 2018 to 31st December 2018 - To upload datas for 2018-2019 - Reg. 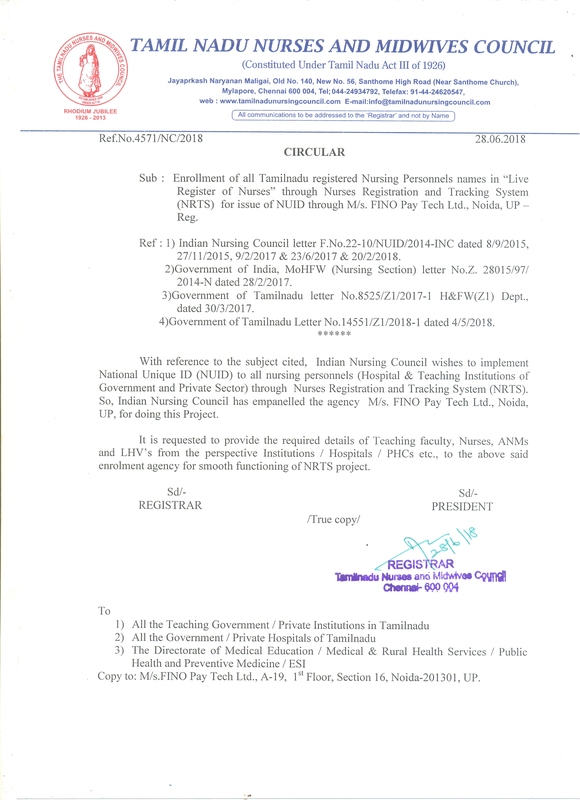 Kind Attention to All Principals of Schools and Colleges of Nursing to depute Nursing Students in rotation to the District Hospitals - Reg.